Millions of individuals suffer to achieve quality, restorative sleep. Whether you toss and turn because of chronic pain, anxiety, or insomnia, there are ways to achieve a peaceful night’s rest. National Sleep Awareness Week is a national campaign to bright light to the sleep issues many Americans face. This article discusses several ways Thermalon moist heat therapy products can help relieve chronic pain, ease stress and anxiety, and deliver a deep, restful night’s sleep. Do you struggle to fall asleep because of lingering headaches, tension, or racing thoughts? The Thermalon Sleep Mask offers soothing, natural relief. Simply microwave the sleep mask for 30 seconds to unleash the power of moist heat therapy. 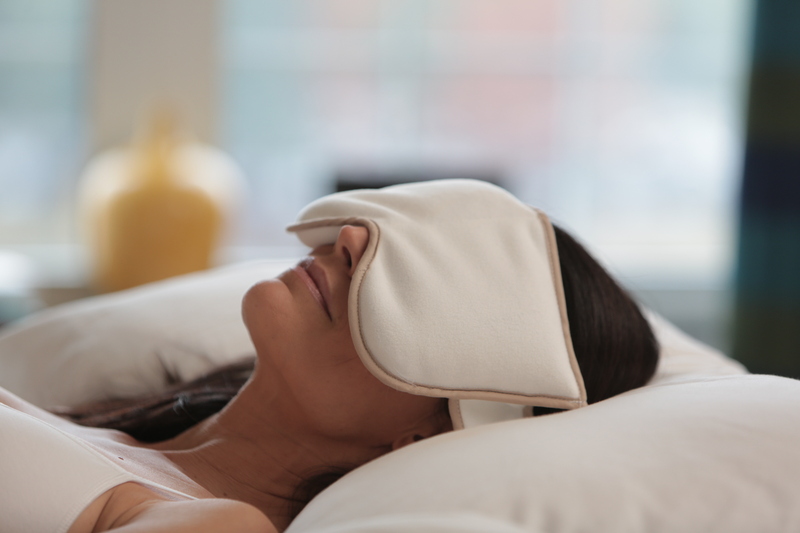 The warm sleep mask relieves painful headaches, migraines, sinus pressure, and tension. Plus, the warm sleep mask provides the perfect ambiance for a relaxing meditation routine before you fall asleep to help relieve stress, anxiety, and racing thoughts. Incorporate essential oils for soothing aromatherapy. Does back or neck pain make you toss and turn at night? Help relieve muscle tension in your neck and back with the Thermalon Neck Pillow. Microwave for 60-90 seconds and enjoy more than 10 minutes of soothing moist heat therapy, helping to relax your tense muscles, stimulate regenerative blood flow, and ease you to sleep. Use the Thermalon Back Wrap to relieve low back pain with moist heat therapy as you fall asleep. The Thermalon Bed & Body Warmer is designed for individuals that struggle to relax before bed. This luxurious moist heat heating pad warms your bed, sheets, and blankets so that you can immerse yourself in a welcoming, relaxing environment as you fall asleep. The Bed & Body Warmer helps to relieve chronic pain and muscle tension with the soothing effects of moist heat therapy. In honor of Sleep Awareness Week use coupon code SLEEP18 to receive free shipping on any order placed within the United States between now and March 31st. Start shopping Thermalon sleep aids and moist heat therapy products.